Growing interest in the development of secure cycle parking at key destinations such as stations has led to the creation of Centres and Cycle Hubs. However, simply picking a site for your Centre/Hub and hoping it works is no guarantee of success. Transport Initiatives has carried out a comprehensive review of best practice for Centres / Hubs both nationally and internationally. We have concluded that there are a range of crucial factors that must be considered carefully to maximise the potential for a Centre / Hub. These include the exact location, detailed internal design, management / operation and crucially how cyclists get to the facility. Transport Initiatives' studies of a number of Cycle Centres / Hubs, including a detailed study for Manchester and Salford City Councils have led us to create a scoring system for potential new facilities. This system scores all the key factors mentioned above and gives a reliable indication of the potential success of any new project. Using this system we can either review existing plans or starting from scratch generate new proposals including all aspects of siting, design, management and accessibility. 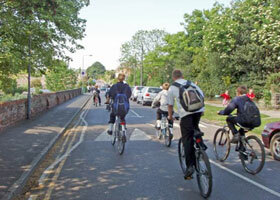 TI members have vast experience of improving routes for cyclists to schools, workplaces and for leisure in both urban and rural environments. 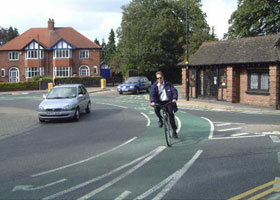 Member's schemes have won awards including the prestigious Prince Michael of Kent International Road Safety Award. Through there audit and review work they have seen many examples of schemes that work which they can apply to new proposals. 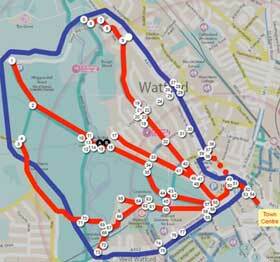 Design services range from outline route plans in Mapinfo to detailed proposals in AutoCAD. Transport Initiatives members are experienced in accident analysis and identification of appropriate prevention measures. This can include broad strategic analysis and more specific analysis of individual sites. An example is the preparation of the York Local Safety scheme programme. One of the most effective ways to increase cycling is to slow traffic down in order to reduce the danger from motor traffic. Traffic calmed roads generally need no special cycling infrastructure and have been shown to reduce traffic speeds and accidents by 50%. A 1mph reduction in speed leads to a 5% reduction in accidents. 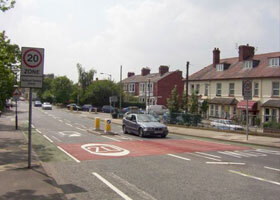 TI members have extensive experience of traffic calming schemes and pioneered the use of speed cushions in the UK. overlaid on their cycle map. used as best practise example by the DfT. Transport Initiatives can also design and implement signing schemes, designing the sign faces, selecting locations and advising on the hardware. 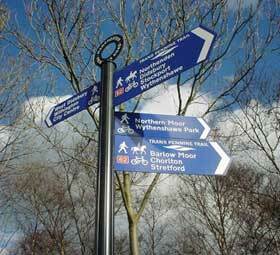 Many signs designed by TI members are used as examples of best practise by the DfT and sign manufacturers.